Spacious and modern furnished double room with a big desk. The double beds can be placed as separated single beds. 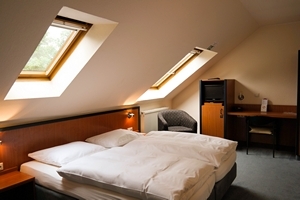 The rooms are available as Smoking- and Non Smoking rooms in the main and in the guest house. Baby crib for free is available on demand.